You’ve got a question? We’ve got the answer! On this page you will find frequently asked questions (and answers) about sealing. Is your question not listed below? Please contact us so we can help you. Why should I wrap/seal my baggage? By applying a sealing, baggage without a lock (or baggage with a dysfunctional lock), will be hold together. Especially if you travel with a backpack, it is important to let the backpack get sealed to protect it against bursting open. The transparent layer of foil will protect your baggage from scratches and dents, which may occur during traveling. It is also possible to get an extra layer of bubble foil underneath the shrink foil, so the suitcase or bag (or other piece of baggage) will be even better protected from damage. Loose parts, like belts or handles, can get stuck during transport. With a sealing, the baggage will become one piece without any loose ends. Did you know a suitcase zipper is easy to open and close again? Simply by using a pen. Even if the suitcase is locked. There are many tricks for opening a locked suitcase. All tricks are easy to watch on youtube.com. Especially persons with bad intentions perfectly know how to open and close a suitcase without you noticing. With a sealing you will be better protected. When the sealing has been opened, this will be clearly visible. If the baggage was opened by customs, it will carry a special customs sticker. If not, go to customs to report someone messed with your baggage and you won’t be responsible for what one may find inside. Like mentioned, there are many tricks for opening your baggage. But in a busy airport environment, a thief has to operate quickly. Baggage foreseen by a layer of foil is more difficult to open, other (easier to open) baggage will be a less complicated target. Of course, sealing baggage is no guarantee for preventing theft, but your baggage will be a less attractive target. 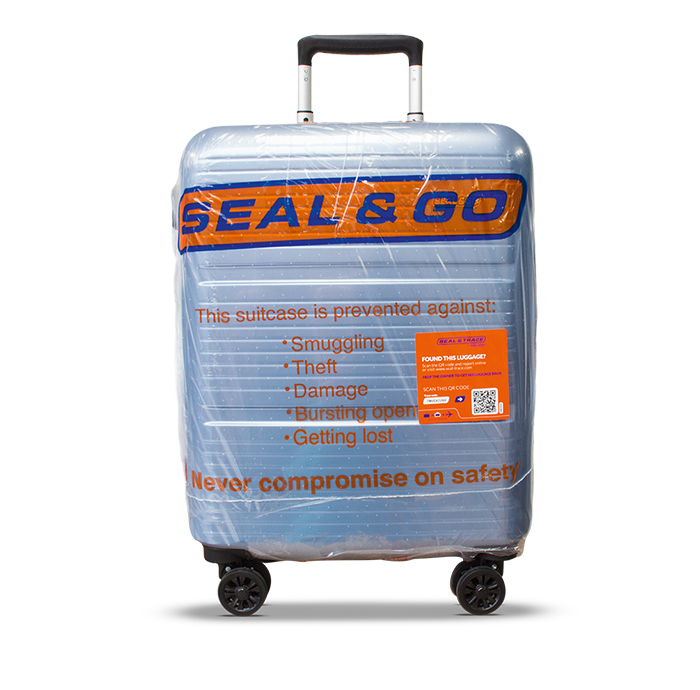 Every sealed piece of baggage comes with a free Seal & Trace sticker. 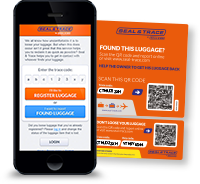 With this sticker you will be able to register your baggage using an online portal. After registration, your baggage will be traceable. So, the thin layer of foil offers more protection than you think! What’s the size of the Seal & Go stroller and backpack covers? Schiphol Airport: €12,00 per piece of baggage or €15,00 for a large suitcase/bag. If your baggage is larger than standard baggage sizes (for example a golf bag) we will charge you for the additional costs. This depends on the size. Can you seal my stroller or backpack? Yes we also seal strollers and backpacks. And we also sell special stroller covers and backpack covers. Opening hours at Schiphol Airport? Can the machine damage my baggage? No, it will not damage your baggage. The temperature of your baggage will only increase by half a degree Celsius. Can I still easily recognize my sealed baggage? The foil is transparent and very thin to make sure you can still recognize your own baggage. The handles and wheels will be omitted, so your baggage does not lose its functionality. How long does it take to seal baggage? Sealing of baggage takes less than one minute. No reservation is necessary.